Yo yo! So, I know what you're thinking: "Whaaat?! It's only halfway through May, what's Sarah doing with another Unblogged Files already?" You see, I just got to Germany this morning, for a three-week holiday! 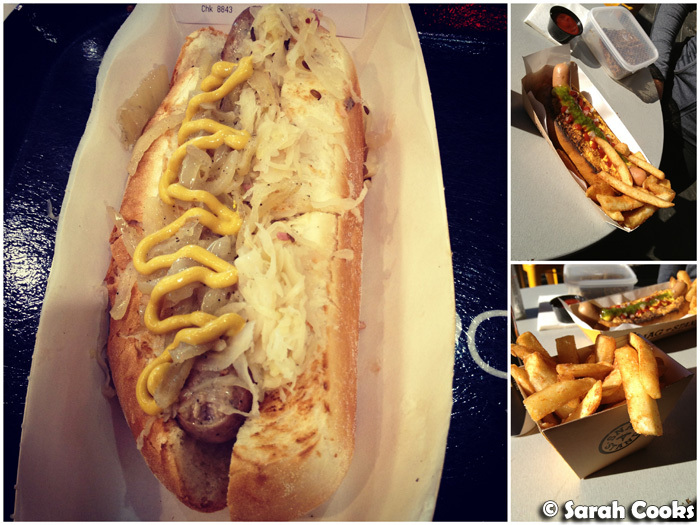 I've got many, many delicious meals planned, so I thought it would make sense to do an Unblogged Files covering all the eating from Melbourne from the first half of the month, and do full posts for the Europe-based eating after I get back! The first half of May was very busy food-wise anyway: I had a week off between finishing up at my old job and starting my new one, my brother was back in town for a week for a whirlwind visit, and I was also trying to catch up with as many friends as possible before my holiday! First thing: cookies. 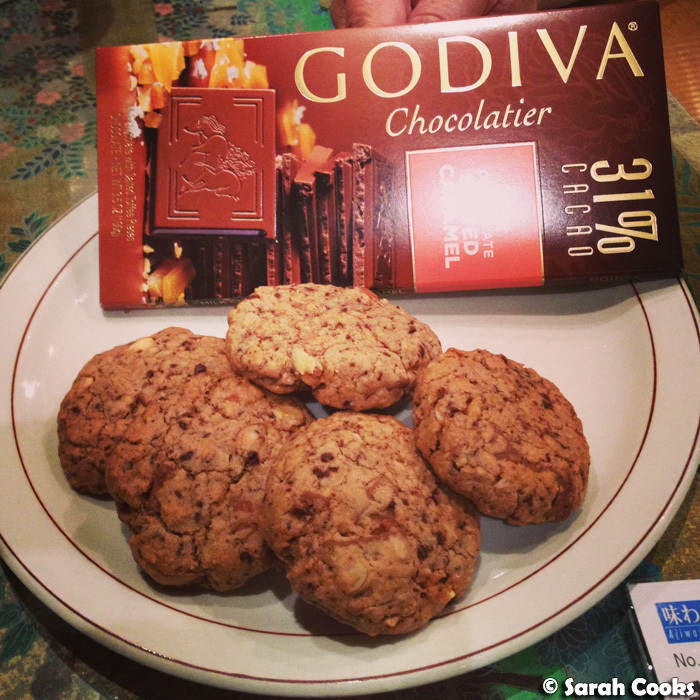 I made a batch of The Rock's Favourite Chocolate Chip Cookies (you can Google the recipe), replacing the suggested chocolate chips with a bar of Godiva Salted Caramel Milk Chocolate that my parents brought back from their most recent trip overseas. Wow. 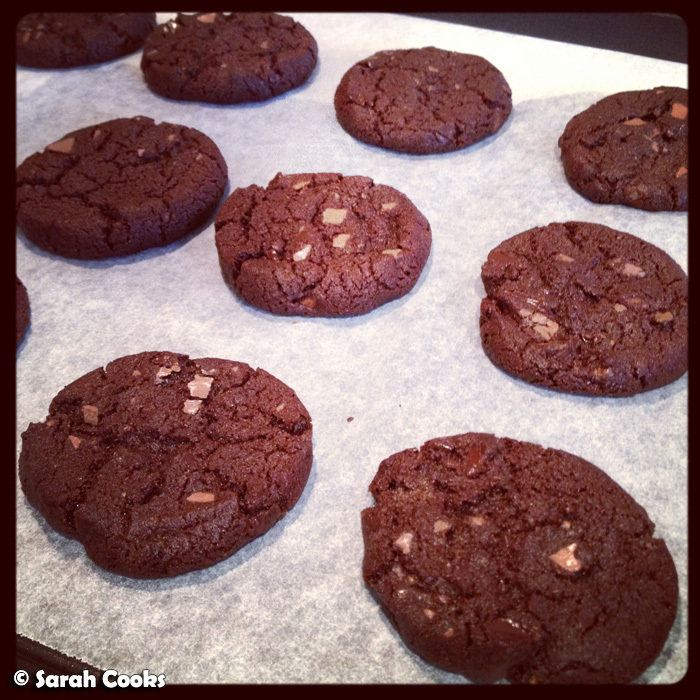 I also made a batch of Dorie Greenspan's World Peace Cookies to take when we visited our friends who've just had a (gorgeous!) baby. These biscuits are also known as Pierre Hermé's chocolate sablés (again, you can Google the recipe), and they're incredible! It's a richly dark chocolate shortbread, crisp and crumbly, studded with little pieces of finely chopped chocolate and the crunch of fleur de sel. I happened to win a $95 voucher from Acland Street Cantina, so took my bro for lunch there. 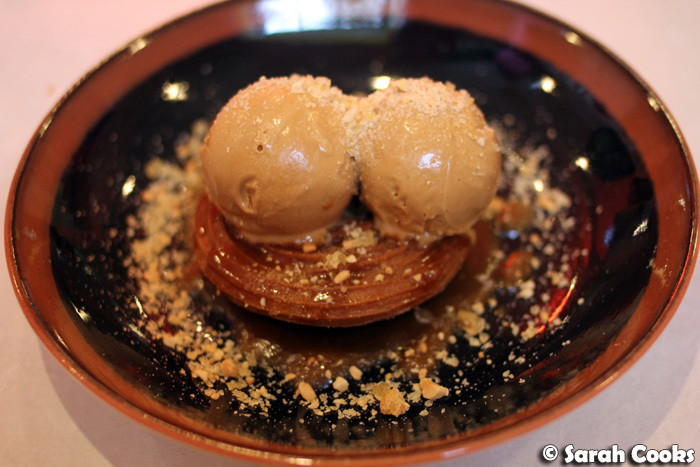 We really enjoyed it and I'll be blogging it in full, but for now check out this picture of their delicious (and giggle-inducing) salted caramel ice-cream churro taco. 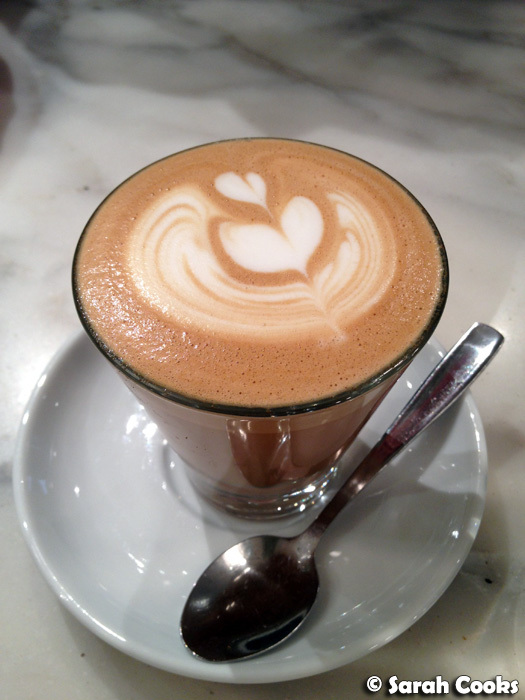 We also had coffee at Sensory Lab (super Melbournian experience, IMHO). Being so busy, I was totally slack in bringing my lunch to work, and visited Snag Stand a couple of times this month - I loved the "Das Bratwurst", which came with a bratwurst sausage, bacon-studded sauerkraut, onions and mustard - although I must say I felt conflicted about buying a grammatically incorrect lunch. (It's "Die Bratwurst!) The chips are very good too (even though I'd have to say Schnitz' are even better). Continuing on the "slack" theme, one morning I didn't even make my own breakfast (for shame! 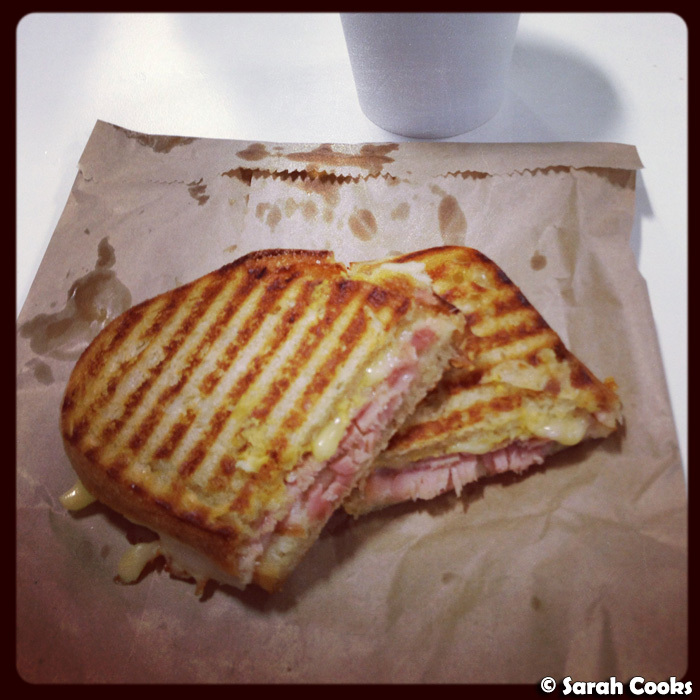 ), and got a Croque Monsieur from Streat. At $8, it's more than I like to spend on breakfasts, but it was very buttery and tasty, and I loved the meaty ham and Gruyère cheese. A nice treat. 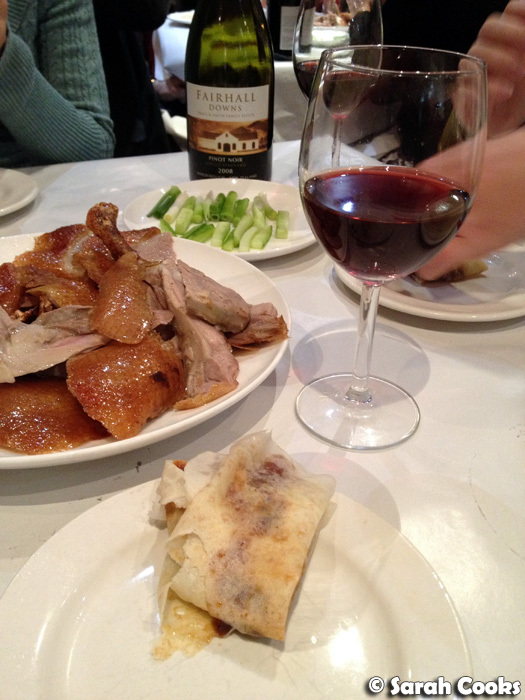 As I said above, I was trying to catch up with friends as much as possible before flying off to Germany - one night, we hit up Simon's Peiking Duck in Box Hill with some girlfriends and a bottle of pinot noir. SO MUCH DELICIOUSNESS. 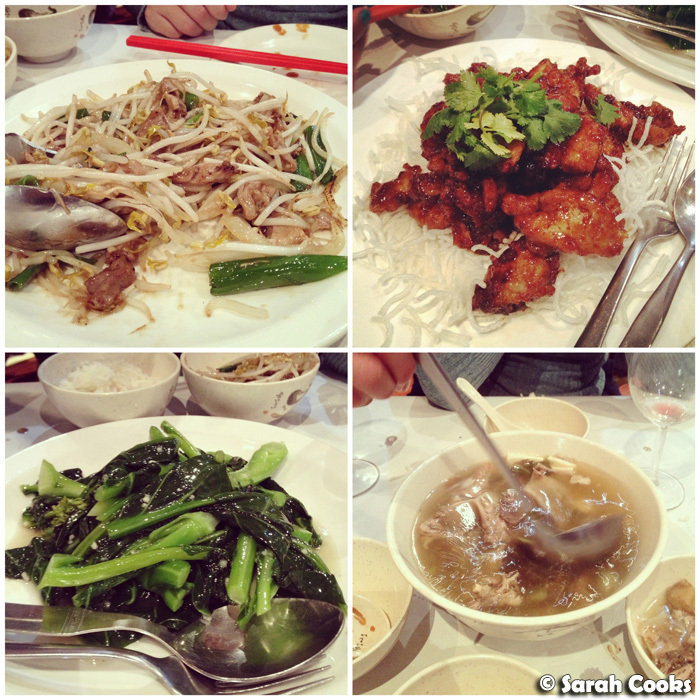 We did one duck between four, and ordered two dishes as well: General Tso's chicken and Chinese broccoli stir-fried with garlic. 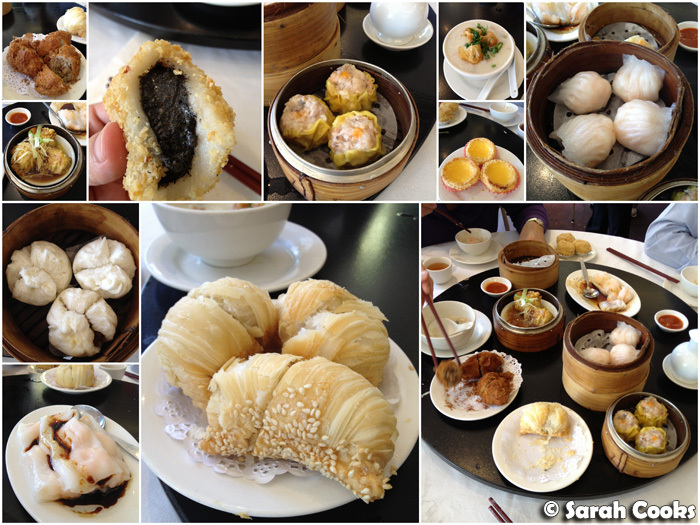 All dishes were uniformly impressive. After dinner, rather than having dessert at the restaurant, we stopped off at Leo's Supermarket and picked up two tubs of Ben & Jerry's and some waffle cones, and had that for dessert. Great idea! 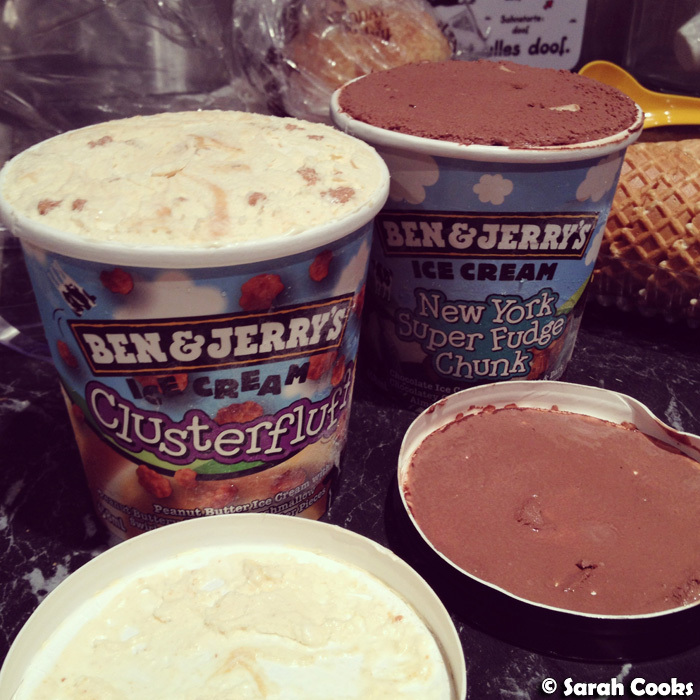 Normally I find Ben & Jerry's a bit sweet, but I can say without hesitation that their Clusterfluff flavour is fabulous! 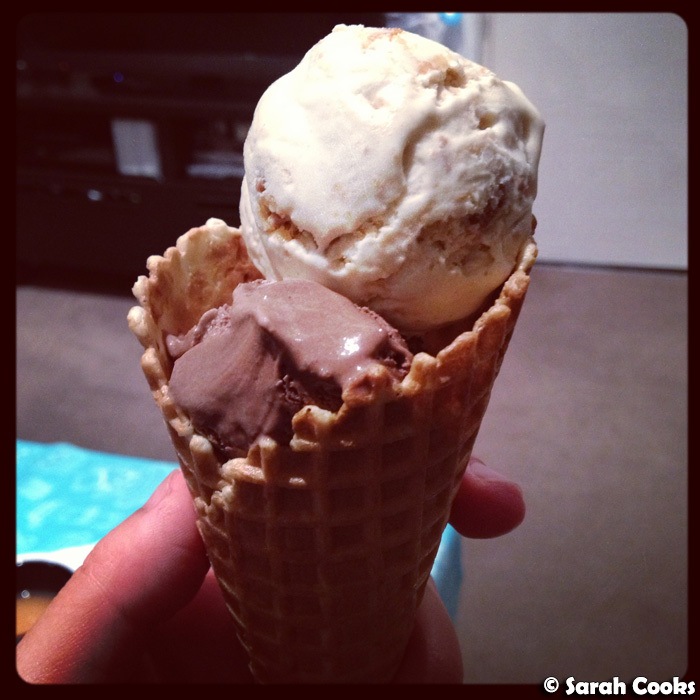 It's peanut butter ice-cream with peanut buttery swirls, marshmallow swirls and caramel cluster pieces. Last Saturday night we celebrated my friend Adri's birthday with dinner at Touché Hombre - I wasn't expecting to love it (I get stressed out when restaurants have a no-booking policy! 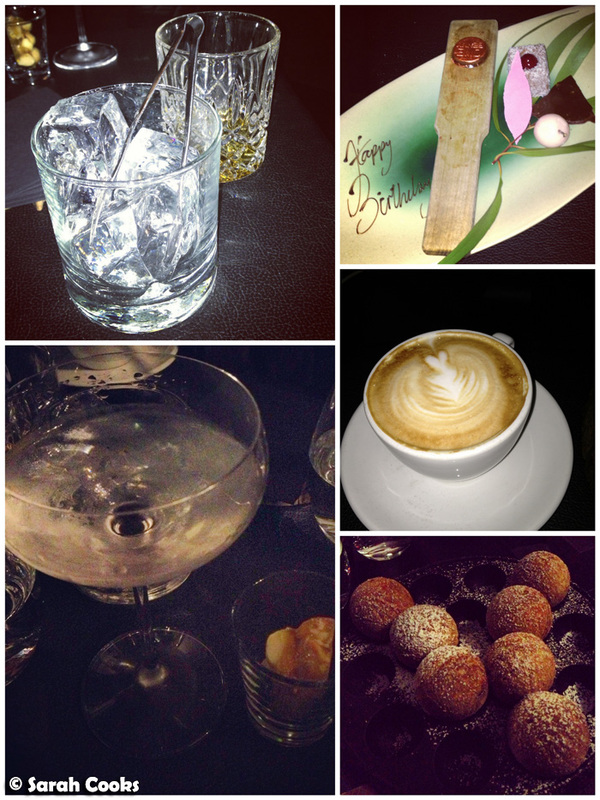 ), but the food was really good and the atmosphere was nice and chilled. I'll be blogging it soon. 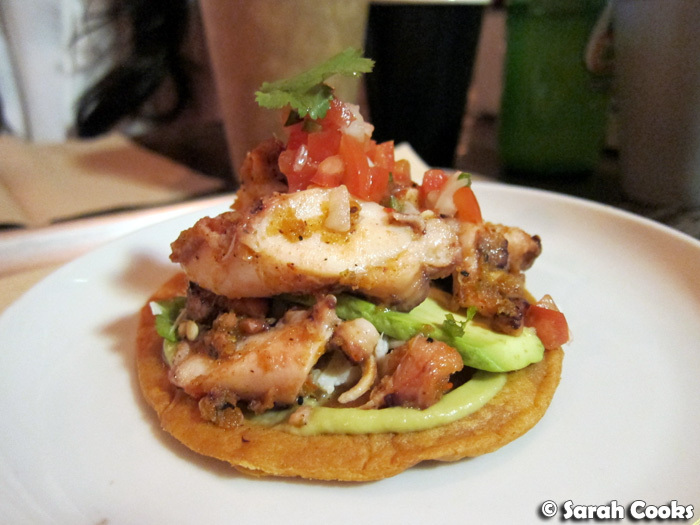 I really liked the Tostada Pulpo - chargrilled octopus, crab claw, spring onion, coriander and pico de gallo on a crisp fried tortilla. To celebrate the new job, (and to save me cooking on my first day!) my friend Jess cooked us the most amazing dinner: sticky roast chicken with mashed potato, homemade gravy and beans/brussels sprouts/mushrooms with a feta vinaigrette. 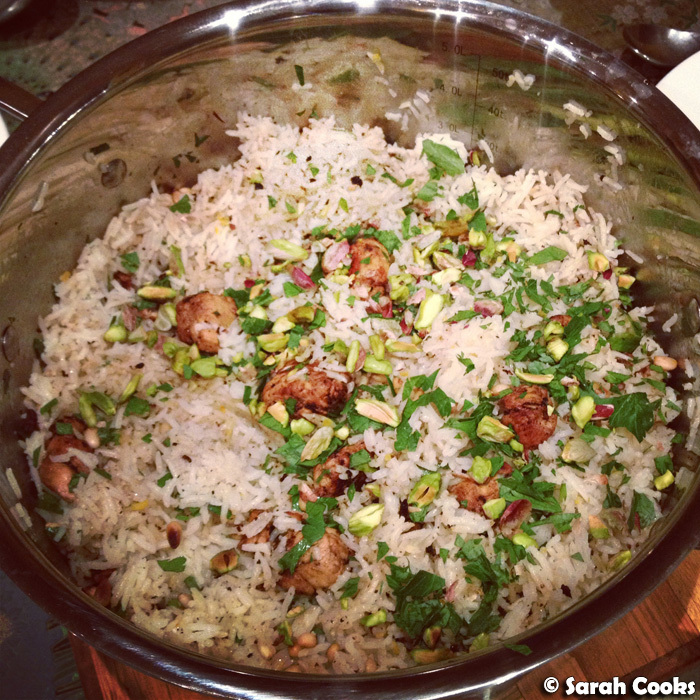 Perfect comfort food for the cold weather! 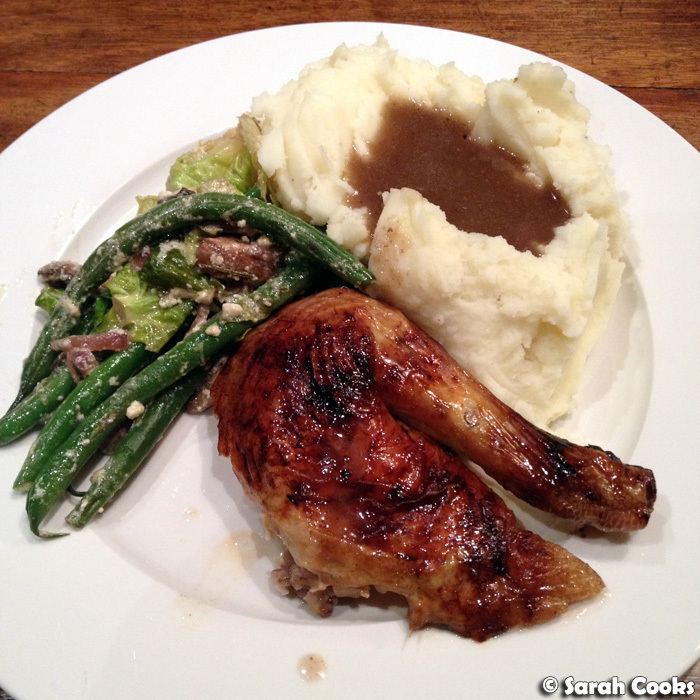 (The mashed potato/gravy bowl thingo was Sandra's idea). A few treats from Burch & Purchese! 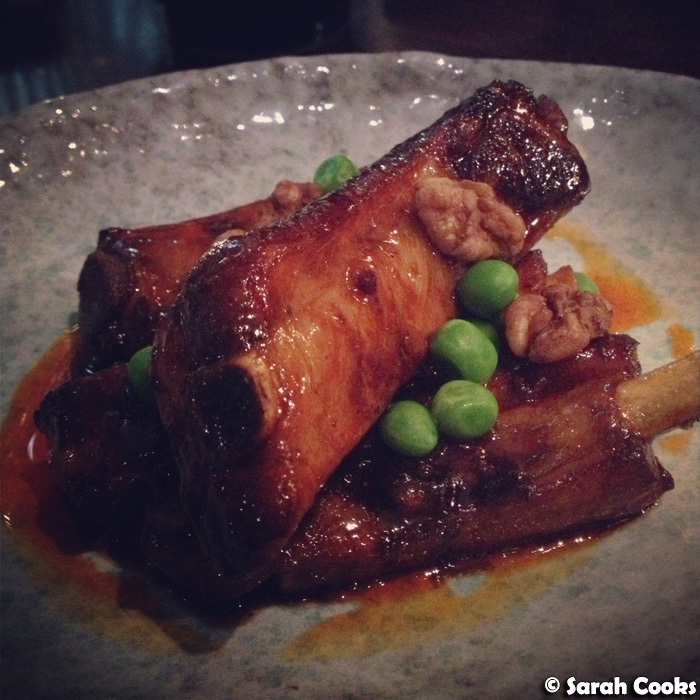 ...and the sticky pork ribs. Afterwards we went for drinks at The Lui Bar, on the 55th floor of The Rialto Building. My mum, who's not much of a drinker, just had a latte, which was one of those famous $10 coffees that come with a plate of petits fours. 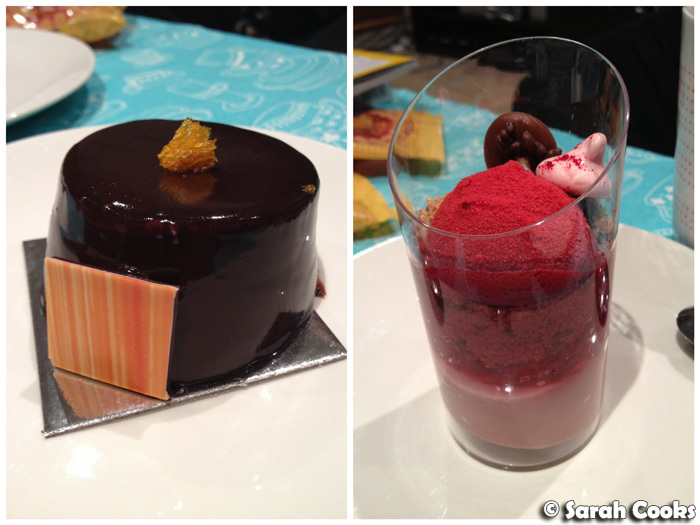 (There was a boule of eucalyptus ice-cream, a "lamington" made of chocolate mousse, a pink candy gum leaf, a piece of crisp chocolate, and a bourbon jelly lolly.) My dad proclaimed the coffee and petits fours such good value that he ordered another one for himself, on which they wrote "Happy Birthday". Yay! Also fabulous were the apple donuts and the macadamia martini, which came with some salted macadamia brittle. Happy Birthday Dad! And finally, we flew off to Germany!! 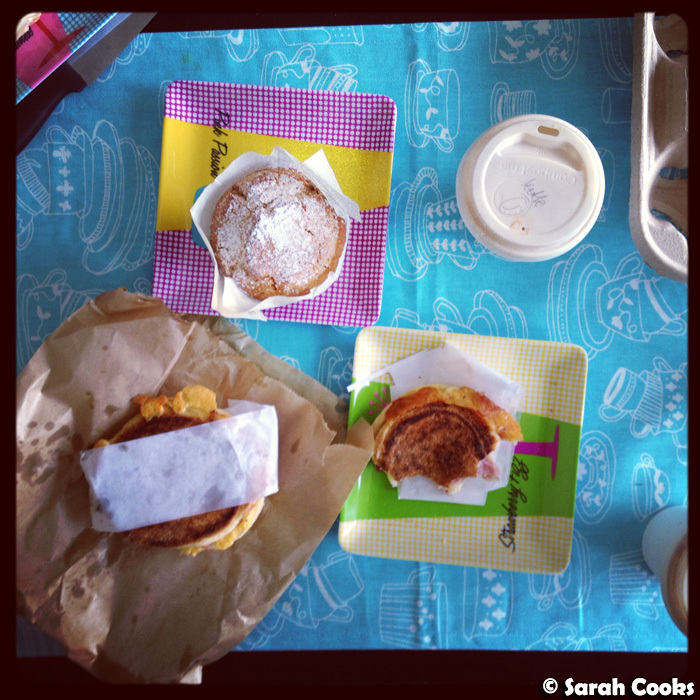 Before driving off to the airport, we had a tasty breakfast at home of takeaway coffees, peanut butter and chocolate muffins, and ham and egg toasties from Porgie and Mr Jones. And that was (the first half of) May! 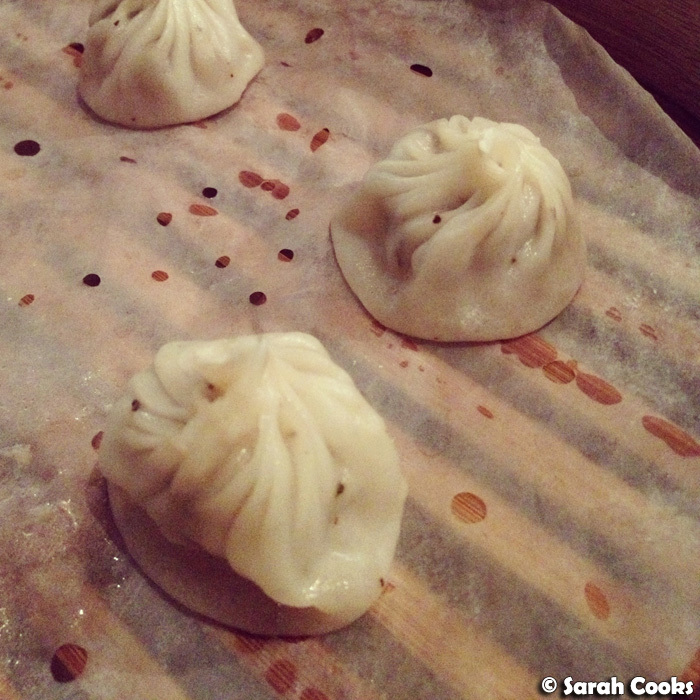 Follow me on Twitter and Instagram to keep up with my European eating adventures! Apart from being in Germany, I have a weekend in London coming up and a few days in Paris planned... and I'm going to buy some stretchy pants tomorrow. Tchüss!! ZOMG! Peanut butter chocolate muffins are, I'm sure, the best way to begin another German adventure. Can't wait to read about all the sausage (snicker) and dumpling balls (snicker) you partake in over there.